I’m the first to admit I have an acquisitive, magpie-like nature. I love buying new cookbooks, my collection of OPI nail polish borders on excessive and shoes, well, let’s not go there. Last week I was killing time at Book First, waiting for the tracks to be cleared after an accident. Book First is my favourite bookstore – the shelves are crammed with beautifully produced, affordable books. Japanese cookbooks have long been an obsession of mine. I love the way they’re produced and the way the authors sprinkle essays about their philosophy throughout the books. So, I came home with three new books last week, one of which is Watashi no o-yatsu, kodomo no o-yatsu (My snacks, kids’ snacks), by Yamazaki Shizuka, a food-coordinator, blogger and author. I want to make almost every recipe in this book! She uses simple ingredients, and has an interesting way of adding Japanese flavours to ‘western’ style baking, with recipes like Kinako Shortbread and Miso Biscuits. 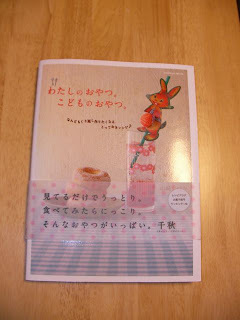 Surprisingly, the first recipe I made from this book was not biscuits, but Daikon Mochi, or Daikon Fritters. We had a massive daikon that needed to be used up, and I’ve always loved the daikon mochi that you get with dim sum. Finely grate the daikon and lightly squeeze the moisture from it. Add the spring onion, ebi (or corn), salt and flour and mix together. Heat the sesame oil in a medium – large frypan and add spoonfuls of the batter (I found it easiest to use two dessert spoons to lightly shape each mochi). Fry over a low – medium element for 3 minutes with the lid on. Flip the mochi over and fry the other side for 3 minutes with the lid on, then remove the lid, increase the heat and fry until lightly golden and crispy. Serve with a dipping sauce made with white rice vinegar and soy sauce as liked. Chilli is good too – but not for kidlets!